With his trademark ability to pick dancefloor hits that test the limits of style and genre, Boom Shankar`s latest offering on BMSS Records pushes forward with new twists, fresh approaches and unusual directions! Trancefusion Chapter 1 expertly engineered over the course of a year, is his 7th CD compilation and also his label`s 20th CD release. Reinvented hypnotic classics stand alongside funky intriguing, innovative projects that blur boundaries without losing the quintessence of Psychedelic and Trance. Some highlights from Chapter 1 include a technodelic funkster from the elusive Electrypnose, Yudhisthira`s new progressive project Aumni, tracks from our Israeli friends Hujaboy, ShivaTree and Mystic, a stellar collaboration between Datacult and Dark Nebula as well as the mind-bending sounds of Reversed Logic and PsiloCybian. 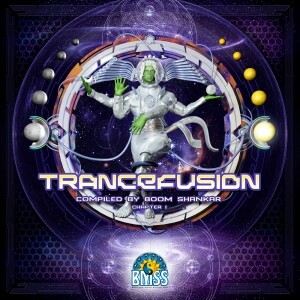 Quintessential and compelling, Trancefusion is a surprising voyage into Psychedelic Trance that stays true to the underground spirit. An unusual retelling of that familiar and beloved sound. Uninhibited, expressive, deep and definitively Psychedelic.